Clip in hair extensions are a quick and easy way to add length, volume, or color to your hair. Many people enjoy them because they are temporary. That means that you don’t make a commitment when you use them. It also means that you can use them over and over again. Clip in hair extensions are super easy to apply. Unlike Hot Fusion and Ultrasonic Cold Fusion hair extensions, they don't require any adhesives or extra tools. Instead, they work because of a metal clip. This clip is pressure sensitive, so all your hair stylist has to do is slip it in and press it shut. It’s easy to do at home, but if you want your hair in a specific style, going to a professional is advisable. Because of how quickly clip-in hair extensions can be used, there are thousands of different types out there. Some of them are sold in single strands. These strands can be used by themselves to add color to your hair or help out with some style. For example, you could put your hair in a ponytail or braid and use a clip-in to conceal the hair tie. The strands can also be used in multitude to add volume to your hair while giving it a natural look. In that case, a stylist would section your hair and put the clips in with space in between them. 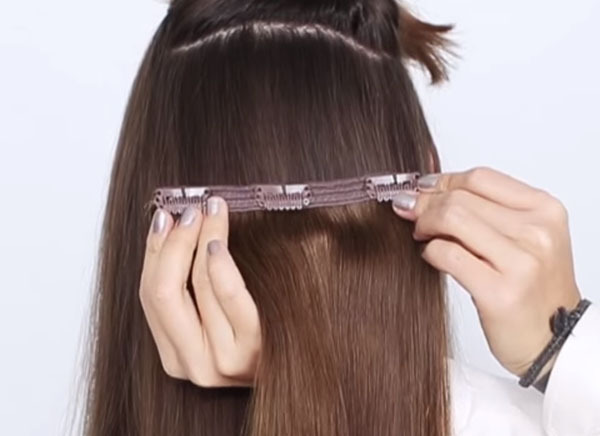 As you may have suspected, there are also clip-in hair extensions that come in the form of bangs. These clip-ins are amazing if you like the look of bangs but don’t enjoy maintaining them. You simply acquire the extension, put it in, and then have it trimmed to the length and style you want. Then you can pull it out whenever you’re in the mood to rock some bangs. Many companies also produce large clip-in extensions. These extensions have more volume than the single strands and are attached to one large clip. They’re good for getting a nice hairdo without having to wait for individual strands to be put in. They also come in a variety of styles and colors for you to choose from. Clip-in hair extensions don’t just come in different styles, but they are made with different materials. You can get both synthetic hair and actual human hair clip-ins, depending on what you want. In general, synthetic hair tends to be more cost-effective. Human hair, on the other hand, is less cost effective, but it provides a more natural look. Additionally, human hair can also be labeled as “virgin hair”. Virgin hair is hair which has not been treated chemically and is therefore closer to your natural locks. Depending on what you want the clip-ins for, one of these types of hair might suit you better than the others.